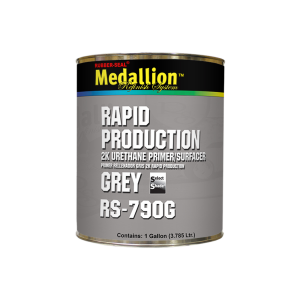 A two-component urethane primer surfacer that can be sprayed as a high/medium build surfacer, as well as, a non-sanding, single-coatsealer. This primer can be dry-to-sand in as little as 50 minutes, depending on film thickness and sands easily. It can be applied over unsanded e-coat primer on inside surfaces, saving hours of preparation time. As part of the Select Shade system, it can be intermixed or tinted to create a variety of colors for optimum basecoat coverage. Mixes 4:1 with RS-791 activator or RS-793 flexible activator and National Rule compliant. Available in quarts and gallons only.